After completing the spoking operation new Universal 36" x 5" tires were purchased (center above) along with heavy-duty brass stem tubes (left above) and 26" x 5" flaps (right above). The new tubes and flaps were placed inside the tires and the tires then slid on the rims. A trick to installing the tires such that the tube and flap don't become caught is to remove the air from the inside of the tube. This collapses the tube flat inside the tire leaving plenty of room inside the tire for the flap. This little trick makes it a lot easier for the tire to be slid on the rim. Next the clincher rings were installed on the rims to hold the tire in place. Finally each tire was inflated with the valve stem valve not installed. This was so the tire could be partially inflated and allowed to deflate repeated times to insure the tube and flap properly seated themselves inside the tire and to insure the clincher rings were properly locking into place (clincher rings not properly locked in place have been known to kill mechanics when they flew off as the tire was inflated to working pressure). Once the tires had been inflated and deflated a couple of times the valves were put in the valve stems and then the tires inflated to their 60 PSIG working pressure. 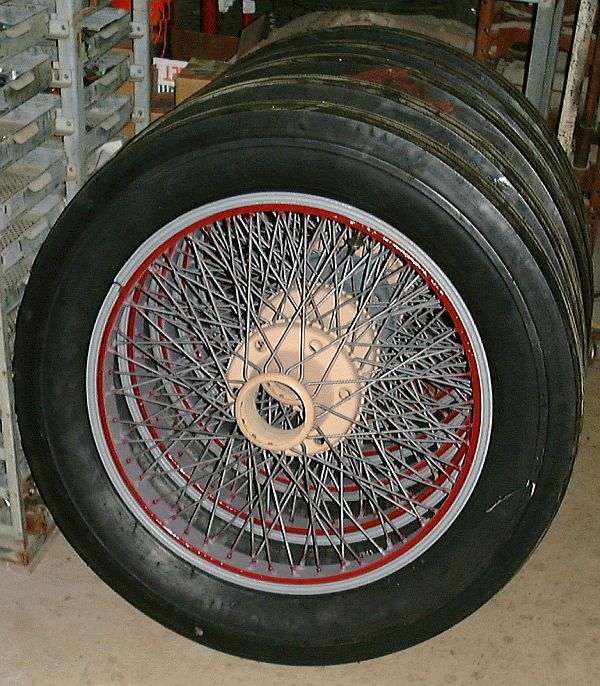 This was all done before painting so that the clincher rings could be installed on the rim without fear of marring the red paint. After the tires had sat for a while they were partially deflated so that they could be masked off with paper. Masking off the tires was done so that the painting operation would not coat the tires as well. The photograph above shows one of the wheels having just been painted with an etching primer. The use of an etching primer insures a good paint bond between the spoke metal and the primer. The color top coat of paint adheres to the primer. If the primer isn't holding fast to the metal under it then both it and the top color coat of paint will flake off. 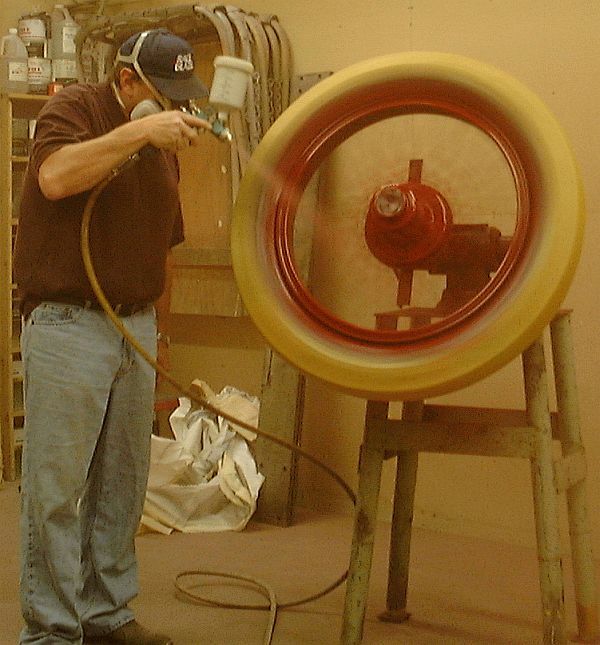 The photograph above shows one of the wheels being painted red. The wheel was spun and as it slowed down a coat of paint was applied. 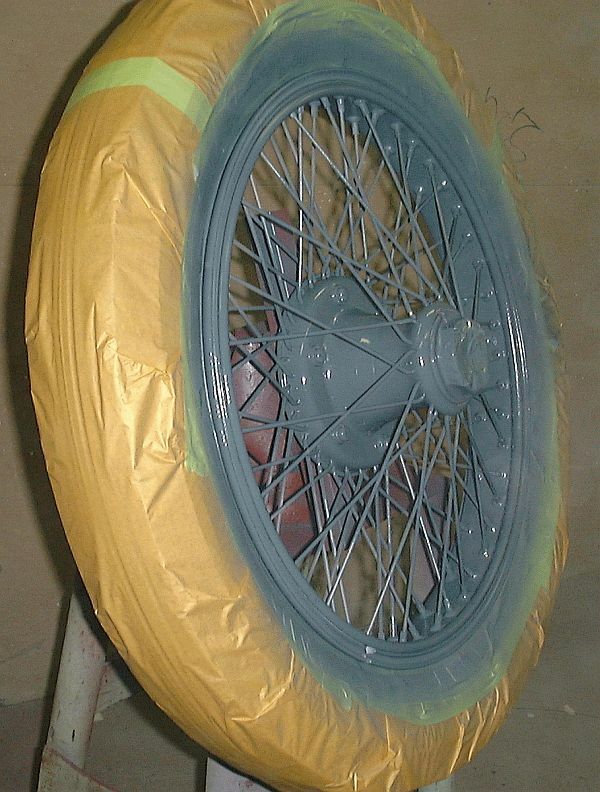 The mounting of the wheel on the fixture permitted paint to be applied to both the inside and outside of the wheel to insure all surfaces of the spokes received an even coating of paint. After the first coat was applied and allowed to become tacky, a second coat was applied. The paint system being employed is DuPont Imron® Polyurethane Enamel. The color for the wheels is RS-593. 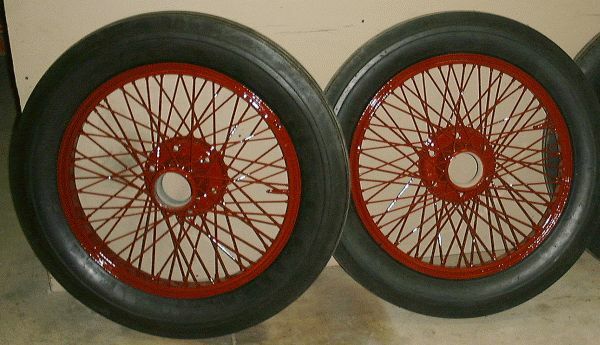 Pictured above are two of the five wheels after painting. Each of the wheels was allowed to dry before the tape and paper was removed. With the tape and paper removed the tires were inflated back to their 60 PSIG working pressure and cleaned up. The final step of the wire wheel restoration was the application of a fine line pin stripe to the hub and on the clincher ring.